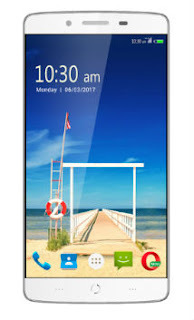 Swipe Technologies, an Indian Smartphone manufacturer just launched its another budget smartphone " Swipe Elite Sense" with powerful specification. Priced at 7,499, the Swipe Elite Sense will go on sale from 6th March 2017 exclusively at Flipkart. 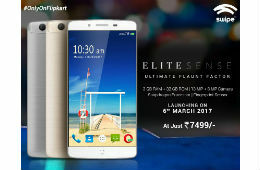 Commenting on the launch, Mr. Ajay Yadav, Head – Mobiles, Flipkart said,” After the enormous success of Swipe ELITE Power and ELITE Max, we are excited to launch the next device from Swipe's stable - the ELITE Sense. This phone will surely strike a chord with customers who are looking for style, power and performance at an affordable price." He Further added, "Being the leaders in the smartphones space, Flipkart is always looking to expand and be more relevant to customers across a wide spectrum. In line with our efforts of innovating and bringing the best technology to our customers, our association with Swipe will certainly yield great results as in the past." Larry Paulson, Vice President and President, Qualcomm India said, “We’re excited to be associated with Swipe on the launch of their new ELITE Sense smartphone powered by Qualcomm Snapdragon 425 mobile platform. Driving the mantle for innovation from India, the Elite Sense offers a smart phone experience defined by the product’s distinct style, performance and connectivity."